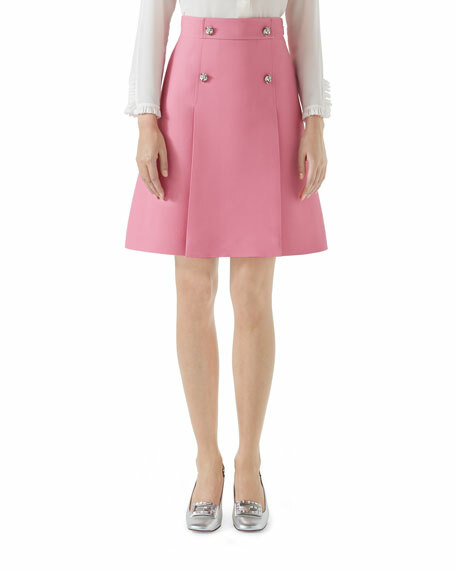 Cady crepe wool-silk skirt with cat-buttons. Gucci skirt in rainbow chevron and flower pattern. Metallic green/red/green Web elasticized waistband. Accordion pleated waist. A-line silhouette. Main: silk. Gucci skirt in rainbow chevron and flower pattern. Metallic green/red/green Web elasticized waistband. Accordion pleated waist. A-line silhouette. Main: silk. Trim: cotton/viscose/nylon. Made in Italy.